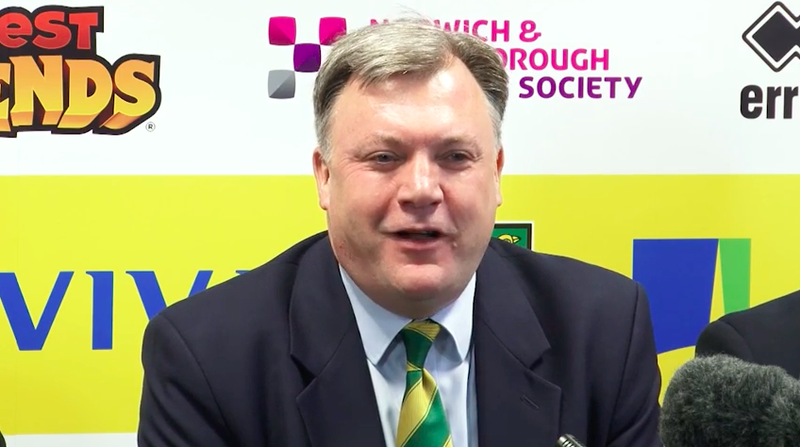 When Ed Balls was appointed as Chairman of Norwich City in December of 2015, it’s fair to say a few eyebrows were raised regarding his appointment. His political background was always going to be divisive, but Balls, in his role of non-executive chairman, has experienced already the need to get it right. When he took to the stand at the AGM on Thursday, one thing is clear, he knows how to deal with people and also how to be the spokesperson for an organisation. Supporters have been critical of Balls, his public persona is one which has been constructed outside of Carrow Road and accessibility hasn’t always been visible. His stewardship is one which has been associated with cost savings and financial uncertainty. Balls has had to put his head above the parapet and alter the direction the club was heading; it was his communication with ex-Liverpool sporting director Damien Comolli that had a profound impact on him. Balls instigated the change and led Norwich into a bold new direction. ‘Back in August and September, it was hard.’ Balls revealed, ‘we had a tough start and there was a lot of discontent in the press and among fan groups about what was going on. ‘Who’d have thought that we’d have three of our academy prospects, who weren’t expected to get in the first team in the first week, but now are pushing out of the team more experience, expensive and older players because they are playing so well. In all of the interviews conducted with the members of the top brass, there was a repetitive theme discussed throughout, that sense of togetherness and opening a line of transparent dialogue with supporters but also within the boardroom. ‘The reason why there is a sense of purpose, unity and optimism in both the board and the room is because you can see, in a very tangible way that it’s working. It’s not about fluky results, I was at Nottingham Forest and Sheffield Wednesday, and I thought we were going to win both of those games’. Upon his appointment, Delia Smith and Michael Wynn-Jones described Balls appointment as important to help with the ‘long-term strategy to shape the future of this great football club’. It certainly feels as though Balls has had to constantly fight critics but also deal with the financial ramifications of relegation from the Premier League. Despite the positivity that is surrounding the club, there was a serious undertone to this AGM, and that was undoubtedly the tough financial situation the club is in currently. ‘Over three years I’ve been chairman of this football club, our income has gone from over £75m a year now down to £28m, we’ve had to make huge cost savings and we’re under great pressure yet that was the most united, buoyant and upbeat AGM that I’ve seen in my time on the board. ‘People can see that everything we’ve been saying, in terms of the sporting director’s role in recruitment, the academy bringing on the next generation of players and the importance of us all working really hard together is beginning to bear fruit on the pitch but also for the mood in this room. The AGM lacked very little questions centred around the finances, with only one question coming from a Canaries Trust member who raised the fact there had been a huge rise in Auditors fees. Balls then adequately answered that question directly, rear for any politician, revealing that the club had fought an investigation from HMRC regarding tax paid on loan players dating back to 2012. It was a different tangent, but one which reinforces the transparency the club are now actively attempting to construct with supporters. They won the case, and in doing so seemingly saved millions of pounds. Speaking on the current financial climate, Balls said, ‘The thing is, you can be rolling in money and be languishing. Look at Manchester United currently, look at the clubs who spend big but don’t deliver. Stoke are having a tough season. But you can also be under huge financial pressure and have a mood of optimism and the naïve thing to say is ‘we’ve solved it’ or ‘it’s easy’. ‘The financial position of this club is tough, the board’s responsibilities are very serious and when we look at our financial projections, we’ve got tough decisions to be taken over the next year. We sold one of our best players, in James Maddison, I think everyone cheers him on now in the Premier League and for England, but we’ve brought in a huge profit on that deal and reinvested some of that money. There is a sense of pride surrounding Norwich’s achievements thus far this season. Given the lack of financial muscle power Norwich have at present, they were always going to have to break the mould and be creative in their approach. Balls and the board are typifying that sense of differentiation from the rest of the clubs in England. ‘You’ve got to keep it under caution and perspective. We’re only in November and it was a tough start and there are teams with more expensive squads in the Championship who still fancy their chances and some bad results and we’re under pressure again. I do think there is a sense of team within the first team squad and staff at Colney, but also among supporters as well. At the forefront of everything Norwich City are attempting to create is this constant challenge against the implications of relegation. Championing this new method was always going to lead to criticism, and in many regards, Balls agrees the jury is still out. But his astute financial eye and clever public speaking make him a powerful asset for Norwich to have at boardroom level. You are right that the 21M quid should be a point of discussion. It’s vital to the longetivity of the club. Unfortunately there are those who have frequently used the phrase ‘balanced the books’ and labeled my review of the annual reports as a “parody”. Yet here we are with 10M’s of quid still to save. By my reckoning that’s about 400K a week. Since the forecast should include Martin’s cancelled contract and any incoming loan fees, how we get 400K per week off the wage is a mystery to me. Plus it’ll get worse as player fee payments are reduced. Our best bet is to get back in to the PL league, which is looking like a possibility, thank goodness. “Ka was like a wheel, its one purpose to turn, and in the end it always came back to the place where it had started.” – King.